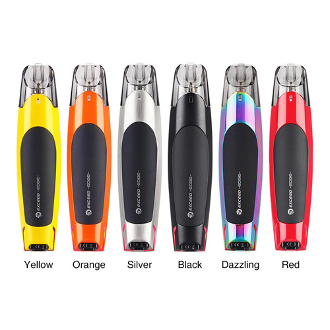 The JoyeTech Exceed Edge is a small and sleek All-In-One pod system vaping device. It is perfect for the discrete vaper whether they are a novice or an expert. It’s ergonomic design and bright colors are inspired by the polished looks of a sports car. It is one of the few pod systems on the market that is designed for use with high nicotine and nicotine salts liquids. The Exceed Edge has a simple, one button design and a battery life indicator light as well as a 2ml e-liquid capacity and a vertical airflow design. The pods have a side fill design and utilize the Exceed EX NiChrome Atomizer Heads for Variable Wattage. The battery has a 650mah capacity and maximum output wattage of 25w. You are able to charge this little guy using the designated charging cable (included) and the micro USB charging port found on the device.